My staff and I created this website as an invitation to acquaint you with our products and our company. We will provide you with up-to-date information plus current techniques to assist you in providing your clients healthy, botanical, and therapeutic spa pedicures and manicures using Estelina's products. The Spa Treatment products are rich in botanical ingredients. Botanicals are Nature's extracts derived from plants that have superior conditioning effects on skin. Eucalyptus, Orange Peel, Kelp, Meadowsweet, Chamomile, and Calendula Extracts are only a few of the wonderful botanicals we use. For example, our Spa Treatment Creme contains Balm Mint, Tea, Thyme, Oak Bark, Horse Chestnut, and Witch Hazel extracts. Our luxurious Spa Treatment products contain Alpha Hydroxy Fruit Acids (AHAs) and NATURAL ingredients that help exfoliate dead skin cells and leave the skin as smooth as satin. Collectively, my products are known internationally as "THE SPA COLLECTION". 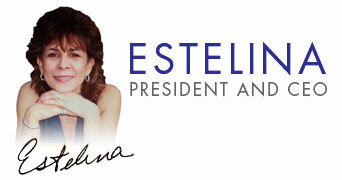 Again, welcome to Estelina's. Remember, our highly trained staff is always available to answer any of your concerns or questions. I hope you enjoy your virtual visit by familiarizing yourself with our products, services, educational instruction, and our staff.